“Jessica Jones” is not the story of a moral crusader. It’s the story of a survivor of emotional and sexual abuse. Granted, she’s a unique survivor of a unique type of abuse. 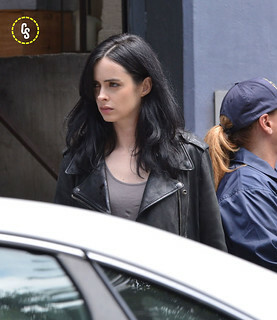 Jessica (portrayed by Kristen Ritter) has super strength, endurance, and the ability to fly—brought on through a chemical exposure a bit like the first step Matt Murdock (Daredevil) took in his origin story. Her abuser is not only a master manipulator, like at least two other characters in the show, but a man who can control people’s minds for several hours at a time. The show hits the highlights on the abuse recovery chart. As Jessica learns how many people have suffered from Kilgrave’s control, she starts a support group for them but doesn’t join in. Occasional words or statements in the dialogue sound as if they were taken from a list of clinical terms. While Jessica pushes people away and is in some sense the only one who can fight this villain, others rely on their community and encourage her to do the same. Many of the story arcs contrast those who are trying to help others with those who are out for themselves alone. And in the final minute of the last show, Jessica starts to come to grips with being someone who can help her neighbors, perhaps even a hero. What the show lacks is the fighting faith we see in “Daredevil.” When Jessica is invited to pray by the only overtly religious character we see, the mother of one of Kilgrave’s victims, she declines, saying she’s just getting over a cold. At this point, she’s alone in this battle. She’s not fighting for the innocent so much as she’s standing up for herself. I say this despite the one victim who has provoked her into fighting, who’s named Hope. She is fighting for Hope, but I think she wants to be rid of her own shame, her past as well as the body count for which she feels responsible, more than anything else. Perhaps “Jessica Jones” creator Melissa Rosenberg and her team of writers intend to highlight their anti-hero’s isolation as her main weakness. Don’t try to recover alone. Don’t fight your demons by yourself. When Malcolm, the only other possibly religious character, is confronted by someone who says we have to watch out for ourselves because no one else will do it, he appeals to his parents, their prayers, their community involvement, and everything he learned in church as a kid. Can no one help anyone? He says if he believed that, he’d kill himself. We also see him in the show’s final minute, cleaning up Jessica’s trashed apartment and answering her phone when someone calls for help. He’s loving his neighbor as himself–if only the show had more of that. Some skilled writers and visual artists worked on this show. For the future, I hope they put their passion behind what makes a story strong, like Malcolm’s character. Speaking of the villain in the recovery support group, he says, “It’s not even the things he made me do that keep me up. It’s the question of who I am. I mean, he turned me into an addict, a liar, a thief. He did that, but I don’t know if it was in me to begin with or if it’s part of who I am now.” That’s how you talk when you are confronted by your own sin-scared nature. You may be able to blame the devil to some degree, but in the end, you aren’t a purely innocent victim. You’re an accomplice. You share some of the blame for what you did, which is the reason you can’t fight your way out of this on your own. I think that’s the kind of hero stories I like most. Well-acted and shot, but in its unrelenting darkness, this show makes “The Sopranos” look like “Leave it to Beaver”.